Many, many years ago a friend of mine took me to Café Gandolfi in Glasgow. I still remember the gratin dauphinoise I had with great fondness but have never been back. Last week I found myself staying overnight in a hotel on the very road that Café Gandolfi is on. But lo! It has a young sibling: Gandolfi Fish. This is where I took my vegetarian business advisor for dinner. He knows me well and is very tolerant so it was not as dumb a choice at it may seem. The restaurant was all dark wood and straight surfaces, both stylish and cozy. The main room has a number of low walls and baffles to separate out dining areas. We got a very comfortable booth in the back. All the tables were set for two – it was a Tuesday night – and most were taken by half seven. The service was friendly and cheerful, the ambiance easy-going yet intimate, but I want to tell you about the food. The menu offered one vegetarian option for each course which is plenty for a fish restaurant. The variety of seafood on the menu is, after all, the main reason to visit this restaurant. I started with the smoked salmon with capers because I thought its earthy flavours would go nicely with the Pinot Noir we were having. It did. Tiny capers, finely chopped red onion and rocket provided a tasty bedding for the salmon. Not a fan of onion soup, the vegetarian starter, my guest abstained and focussed on mapping my goals for the following day’s networking event. The evening’s special was langoustine with mayo and chips. Too good to resist. (It was lucky for my pocket that they didn’t have lobster that day.) The langoustine came straight from the pot, actually too hot to handle. I got four enormous, juicy, sweet and well-fleshed critters on my plate. I took my time picking the flesh out of tail, leg and claw, slurping contentedly and trying my best not to shower my guest in bits of seafood as he helped me look at my business in a new light. The mayo was delicate and the chips fluffy like good roast potatoes. 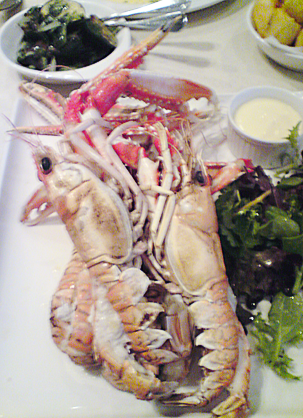 I didn’t have much of either – the langoustine were too good to need sauce and too big to need a side dish. The chips came in a separate bowl so I could share them with my guest, whose spinach and mushroom pithivier – a round puff-pastry pie, or pasty – was tasty but too quickly devoured, as was his side of butter-cooked courgette. Too full for dessert I finished with a glass of Muscat and my guest with a glass of port. The bill came to £84. (My main and the Pinot Noir accounted for just over half of that. Crustaceans of that quality do not come cheap.) As business dinners go, I think it was a huge success: we had a good chat, great food and I came away with a lot of good advice and a plan for the future. Part of that plan is a return visit to Gandolfi Fish.